Life is too short to be unhappy at work. Yet far too many of us aren’t even close to being content—much less delighted—with our work or our workplaces. Instead, we are stressed and exhausted. We can’t remember what we used to love about our jobs. Colleagues we trust and respect are few and far between, and half the time it doesn’t even feel safe to be ourselves. All of this is spilling over into our personal lives. We’re having a hard time sleeping or have given up on exercise. Relationships are suffering, too. We feel trapped and struggle to see how things will get better. No one wants to live like this. Still, a lot of us give up and settle for less-than-fulfilling jobs. 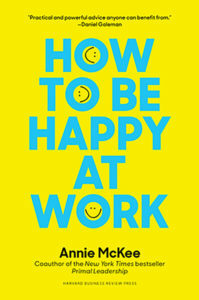 We tell ourselves that we’re not supposed to be happy at work; that’s for other parts of life. We try to cope by avoiding that bad manager or getting that stubborn, annoying person off the team. We shut down, give less, and fantasize about telling someone off. Sometimes we run away from the job, the company, even our careers. But running away isn’t going to make things better. To be happy, I’ve discovered, you’ve got to run toward something: meaningful work; a hopeful, inspiring vision of your future; and good relationships with the people you work with every day. I’ve always been fascinated to find that rare and special company where people are happy at work. In these companies, people are profoundly engaged, motivated, and committed. In these companies, individuals and the enterprise thrive. Over the years, though, I’ve been puzzled and dismayed at the sheer number of people who are deeply unhappy at work and how hard it is to reach them. I myself have had periods when I was truly happy and thriving at work and times when I was miserable. What, I wondered, makes the difference? What leads to long-lasting fulfillment at work? What leads to happiness? And can we even expect to be happy at work? Does it really matter? What I have discovered in my work with leaders around the world is both simple and profound: happiness matters at work as much as it does in our personal lives. And when we are happy, we are more successful. This flies in the face of the myth that we don’t have to be happy at work and we shouldn’t even expect to be. Luckily, though, we live in a time when organizations and academia are taking happiness seriously. My studies of organizational culture and leadership practices in South Africa, Cambodia, Italy, France, Germany, and the United States show the same thing: when we feel deep, abiding enjoyment in what we do, we learn more, see more, and do more. So, happiness matters. And to be truly happy at work, we need purpose, hope, and friendships. We are wired to seek meaning in everything we do. It’s what makes us human. In some cases, it’s what keeps us alive. In his classic book, Man’s Search for Meaning, Austrian psychiatrist and holocaust survivor Victor Frankl shows that even in the worst of circumstances, purpose, hope, and connection are what keep us going. True, his story of finding good in evil and pursuing a noble purpose in spite of the horrors of life in concentration camps is nothing short of heroic. Yet, as Frankl so eloquently shows us, we strive to find meaning in our day-to-day lives no matter where we are or what conditions we’re subjected to. As you have probably discovered, you can easily lose sight of what you value and ignore the aspects of yourself that matter most to you, especially when you’re struggling with dysfunctional organizations, bad bosses, and stress. You’re then likely to put meaning and purpose on the back burner or wait for someone else to give you a compelling reason to love your job. Couple all this with the outdated but pervasive notions that personal values don’t belong in the workplace, and you have a recipe for disengagement and unhappiness. You need conviction to insist on living your purpose at work. As you will see in How to Be Happy at Work, the effort is worthwhile. Having a sound, clear, and compelling purpose helps you to be stronger, more resilient, and able to tap into your knowledge and talents. As you discover which aspects of your job are truly fulfilling—and which are soul destroying—you will be in a better position to make good choices about how you spend your time and what you pursue in your career. Like meaning, hope is an essential part of our human experience. This is as true at work as in any corner of our lives. Hope, optimism, and a vision of a future that is better than today help us rise above trials and deal with setbacks. Hope fuels energy, creativity, and resilience. Hope makes it possible to navigate complexity, deal with pressure, prioritize, and make sense of our crazy organizations and work lives. And hope inspires us to reach our potential—something virtually everyone wants for themselves. Unfortunately, we often assume that our organization’s vision is enough to keep us hopeful and focused on the future. I’ve rarely seen this to be the case. An organization’s vision, however inspiring, is for the organization—not you. Even the most noble organizational vision seldom speaks to our most cherished, personal hopes and dreams. To be truly happy at work, we need to see how our workplace responsibilities and opportunities fit with a personal vision of our future. This kind of vision emerges from hope and optimism, which we can, with focus and hard work, cultivate even in difficult jobs and toxic workplaces. When we see our jobs through a positive lens, and when a personal vision is front and center in our minds, we are more likely to learn from challenges and even failures, rather than be destroyed by them. With hope, optimism, and a personal vision, we can actively choose a path toward happiness—a path away from disengagement, cynicism and despair. Resonant relationships are at the heart of collective success in our companies. That’s because strong, trusting, authentic relationships form the basis for great collaboration and collective success. But, I’ve found, we need more than this to get us through good times and bad. We need to feel that people care about us and we want to care for them in return. This, too, is part of our human makeup. We also want to feel as if we are accepted for who we are, and that we work in a group, team, or organization that makes us feel proud and inspires us to give our best effort. Adding it all up, the kind of relationships we want and need look a lot like friendships. Yet, one of the most pernicious myths in today’s organizations is that you don’t have to be friends with your coworkers. Common sense and my decades of work with people and companies show the exact opposite. Love and a sense of belonging at work are as necessary as the air we breathe. Purpose, hope, and friendships don’t just appear magically. You need to work for them. You need to engage in mindful self-reflection and be truthful about what you discover. Then you need to act.